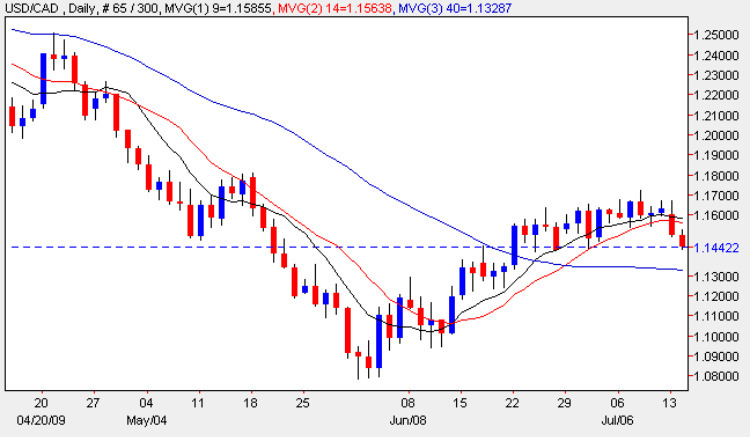 At long last the usd to cad currency pair awoke from its slumbers yesterday ending the trading session with a wide spread down bar as the recent rally in the US Dollar of the last few weeks appears to have run out of steam, with the daily candle closing with a deep upper wick and below both the 9 and 14 day moving averages. With the break and hold below the aforementioned moving averages this now suggests that we are witnessing a reversal in sentiment and should this be combined with the a deeper move and close below the 40 day moving average then this will confirm the picture. The 1.165 to 1.170 resistance area has remained intact and provided an insurmountable barrier to any move higher. As the pair move lower once again the support level at 1.13 now comes back into play and should this be breached then we may well see a deeper move to re-test the 1.08 level last seen in late May. All the items of fundamental news on the economic calendar for the US dollar are covered on the Eurodollar while Canada yesterday’s Bank of Canada suggested that Canadian businesses are at their most optimistic since 1999 and no doubt helped to boost the Loonie. The only other item of news for Canada has been the release of new car sales figures which came in on target at 1% and marginally better than last time around when figures were flat at 0%.